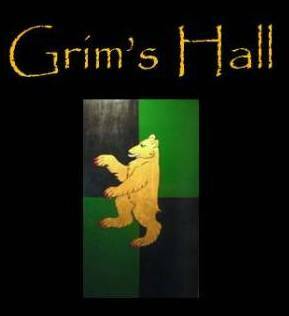 When I first proposed the concept for the club, I had intended that the second book would be Nelson Lee's Three Years Among the Comanches. I haven't been able to find an etext version of that, however, and I'd like to try to maintain as much of the club as free and readily accessible online, to ensure we can all participate. When we discussed it last, several of you endorsed Plutarch, and several Chaucer. I'm going to tap Eric to try to pull a few selections from the works of Plutarch online -- it's a very long work taken as a whole, but Eric's expertise in these things Roman will serve us well. While he's doing that, why don't we go ahead and do a couple of the Canterbury Tales? Based on our recent discussion of Chaucer, I'd like to do The Franklin's Tale and The Wife of Bath's Tale. These are not so very long -- we won't need weeks to read them -- so why not try to aim for those for next week, i.e., a week from this Sunday? Following that, we'll tackle Plutarch, if Eric has prepared for us a good selection of lives to consider. Mr. Brooks says the Tea Party members are "Wal-Mart Hippies." I take it he thinks that's a clever line, because I heard him repeat it while watching that clip from the Colbert show a few days ago. So, what does it mean to shop at Wal-Mart? I started looking into how and why Walmart could be plausibly competing with Whole Foods, and found that its produce-buying had evolved beyond organics, to a virtually unknown program—one that could do more to encourage small and medium-size American farms than any number of well-meaning nonprofits, or the U.S. Department of Agriculture, with its new Know Your Farmer, Know Your Food campaign. Not even Fishman, who has been closely tracking Walmart’s sustainability efforts, had heard of it. “They do a lot of good things they don’t talk about,” he offered. Mr. Brooks is also wrong to say that the Tea Party has a 'mostly negative' agenda: it actually has a positive document that explains precisely how it wants the government to function. It's called "the Constitution of the United States." 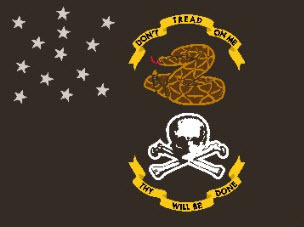 The thing is, these crazy Tea Party people take it seriously -- they really want the government to function just that way, Tenth Amendment and everything. We discussed this issue a few days ago. The main thing seemed to me that the Jews aren't really bothered by "medieval" swords' having been borne against their ancestors, but rather by what their ancestors did with swords during Israel's heroic age. After the Holocaust, their own heroic tradition must seem alien and alienating; whereas Tolkien's tradition, because it was the root of Just War theory and the idea that heroes should protect noncombatants, would only make more sense after World War One and Two. A few more writers have considered the question since, and some of them (not really Wonkette) have serious thoughts about the issue. Is Christianity fundamentally more comfortable with the pagan than Judaism, as the author above asserts? I doubt it. The basics of Northern fantasy draw from a rich peasant cultural folk tradition which the Christian church ignored at best, and attempted to suppress at worst. The tradition was most robust in the regions which were Christianized last, so that relatively thick cultural memory remained from which to draw during the 19th century Romantic revival of national traditions. It is notable that Ireland in particular in the British Isles preserved its own mythic tradition; I chalk this up to the indigenous origins of Christianization, so that the culture-bearers of the past were not superseded by missionaries who dismissed the indigenous stories as being part & parcel of the pagan intellectual edifice. Tolkien was in part trying to create an Anglo-Saxon mythic cycle from fragments such as Beowulf and Scandinavian analogs. The Irish have no need of reconstruction. Culturally the Jews are very distant from their peasant origins, and naturally much more detached from their pagan past than Northern Europeans. For the past 1,000 years Ashkenazi Jews have been an urban minority, as insulated from the world of faerie as Christian priests. No wonder that Jewish authors, such as Neil Gaiman, draw upon Northern motifs. How popular is urban fantasy as a distinct genre anyway? Russ Douthat of the New York Times asks why Jews would want a Jewish Tolkien at all. But once you add up these insights, they jostle uneasily with Weingrad’s professed desire for a Jewish Tolkien, or a Jewish Lewis. What he seems to have demonstrated is that modern fantasy depends on Christianity, or at least a Christian-pagan synthesis of some kind, for its forms, conventions, and traditions. This suggests that you could write a novel that embodies a kind of Jewish critique of fantasy — in much the same way that China Miéville’s novels are a kind of Marxist critique of Tolkien, Marion Zimmer Bradley’s “Mists of Avalon” was a feminist critique of Arthurian-based fantasy, Philip Pullman’s “His Dark Materials” trilogy is an atheist’s critique of C.S. Lewis, and so on. (And indeed, Weingrad’s essay reads Lev Grossman’s new novel “The Magicians” as a kind of crypto-Jewish critique of Narnia and/or Harry Potter.) But the genre itself will remain irreducably Christian, and a truly Judaic fantasy would have to belong to, or invent, a different genre altogether. Those two posts seem to run straight at each other! So-called "urban fantasy" is a new idea, actually; we used to call that genre "horror," because it was meant to be horrible. Lately it has become fashionable not to dread vampires, but to envy them. The werewolf was supposed to be a symbol of what it would be like for man to lose his humanity, and be turned back into a beast without reason or self-control. It has been converted, lately, a symbol of what it might mean for a man to be more in harmony with nature. Today we are asked to imagine the joy of running down a deer under a full moon, and drinking its blood. That's fantasy, perhaps, but it's not heroic fantasy. It is the notion of heroism that bothers. It is interesting that so many would rather be monsters than dare be heroes. That says much about how difficult it is to be a hero, and how very difficult to believe in one. It is harder, I think, for some people to believe in heroes than vampires. That is true even though they might meet a hero in the street, while vampires do not exist. When we lived in China, there was a theme park near Hang Zhou that was called "Americaland." It was supposed to be a place you could visit to see what that strange place called America was like. No one would ever give us directions as to how to get there, probably embarrassed about what the stereotypes would reveal. Americaland is real place for British writers, it is built from thousands of fragments of American TV, films, music, comics and other cultural artefacts. It’s a place filled with 1950’s dinners and long desolate highways among other things. And its just as imaginary as a Britain filled with red telephone boxes and bowler hatted business men. And Swedes! I somehow entirely missed this band called "the Rednex," whom I found tonight entirely by accident while searching for a traditional tune. They are nothing except a Swedish projection on American mythology, especially the mythology of the West. This is a little bit shocking, like discovering that you've been made into a god by superstitious islanders in the South Seas. A fertility god, at that! The clear effect of even single-hand sword blows against steel helmets. In the center a sword splits the top of a helm from behind. On the right two swords hack into the sides of helmets while a spiked mace delivers a crushing blow. Notice also the portions of each sword (their center-of percussion) that does most of the striking is invariably the last third to second-half of blade. 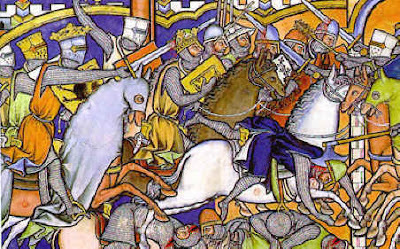 One rider in the center has an arrow in his cheek that appears to have hit behind his mail coif. On the lower right, a long axe cuts powerfully against a rider’s neck and back of the head, pulling him off his mount. On the ground one fallen fighter has deep shoulder and head wounds while another has a deep cut on the neck. Four different types of helmet are visible. All the shields appear to be medium sized flat heaters. From the gruesome Maciejowski Bible, c. 1250. ...a story about a cowboy. As he was doing that, he kept swatting at some flies that were buzzing around his head. The cowboy says, "Havin' some problem with them circle flies?" After a long pause, the cowboy in his Texas drawl says, "Sure is hard to fool them flies, though." "Chivalry & Solidarity in Ultimatum Games"
An interesting game theory experiment from 2001 appears to show that women find it very easy to come to agreements with other women; but men are far readier to accept offers from women than from other men. The two effects are noteworthy, though painting the woman/woman effect as "solidarity" seems a bit odd. It's more likely that they understand each other, and have similar desires to come to agreement; whereas men, who understand each other, want to compete. 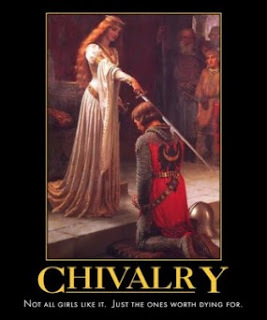 By the same token, "chivalry" is the wrong term here; this tendency describes all men who participated. It would have been very great good luck to gather only chivalrous men into the study! When a woman is his partner in the game, however, a man becomes much less competitive: he is ready to accede to her requests almost at the same rate that women agree to accept/agree with either men or mixed groups. Men facing other men, however, accept offers only if they are much more generous. The graph on page 184 is the main thing, I think. It shows that actual results are fairer in men/men pairings; but agreement is far more common in female/female pairings. That may mean that women are more interested in agreement than fairness (or gain); but it also may mean that men are more willing to resist authority if they feel it is not treating them fairly. After all, the proposer is in the position of authority where the resource division is involved; all the respondent can do is accept or reject the proposal. Men would rather punish unfair actors than seek agreement, even if that means gaining nothing rather than gaining an unfairly small amount. Unless, that is, they are receiving the proposal from a woman: then, they're much readier to be treated unfairly! Another way of saying that, though, is that they are more willing to accept female authority -- fair or unfair -- than they are to accept unfair male authority. From another man, they will only accept fairness. This only treats initial acceptance, of course. One might later resent being treated unfairly, even if this proves that -- in some cases -- one is readier to be treated unfairly. It's also interesting that both men and women are readier to be treated unfairly by women than by men. A find in archæology is startling because of its age, but not because of its purpose. [U]nder our feet, according to archeologist Klaus Schmidt, are the stones that mark the spot—the exact spot—where humans began that ascent. Göbekli Tepe—the name in Turkish for "potbelly hill"—lays art and religion squarely at the start of that journey. This we have heard before, and wisely. and irrational elements as only men and mystics can use them. to see that dawn breaking behind bare uplands or solitary peaks. standing still eternally as if a stamp would shake the world. The dawn of history reveals a humanity already civilized. Perhaps it reveals a civilisation already old. There are a few men who have seen so clearly as to be able to predict both the future and the past. Chesterton was one. "That Bull Wouldn't Hurt A Kitten." It's part of the honor of those who work with large and powerful animals that there is a certain danger in the work. Frequently we play that down, amused at those less experienced with the creatures' strength and willfulness; but the danger never passes. Ricky Weinhold, of Reinholds, was attacked Saturday by a 1-ton bull on a farm where he leased barn space in Wernersville, about 60 miles northwest of Philadelphia, Berks County Deputy Coroner Terri Straka said. The son of the farm's owner found his body Sunday in an outdoor pen. The property owners had encouraged Weinhold to get rid of the bull, Straka said. She said the same animal believed responsible for the weekend attack rammed Weinhold last summer, breaking several of his ribs. Well, bulls are dangerous. Mr. Weinhold doubtless knew that, and gloried in what he did. Anyone might die in a conflict with a bull, and all must die sooner or later. At least here is a man who lived. All of which reminds me of a story. It is meant with no disrespect, told in this context. As I said, it is the essentially dangerous nature of the bull that makes it honorable to deal with bulls; so this story is no insult, but a blessing. The old rancher nods politely, apologizes, and goes about his chores. A short time later, the old rancher hears loud screams and sees the officer running for his life chased close behind by the rancher's prize bull. With every step the bull is gaining ground on the officer, and it seems likely that he'll get "horned" before he reaches safety. The old rancher throws down his tools, runs to the fence and yells at the top of his lungs..... "Your badge! Show him your badge!" Of course, in real life a Federal officer needs a warrant as well. Not, that is, that bulls are any more impressed with the one than with the other. 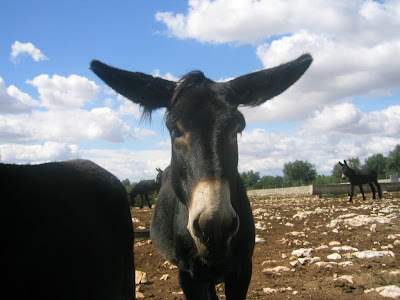 (c) You do not know not-mule. Knowledge by deduction would normally permit you to reason to not-mule; this experiment suggests we may not be able to do that with confidence. But it's neither a mule nor a zebra. 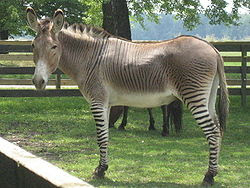 It's a zonkey. 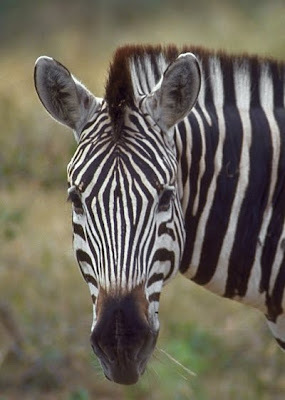 The real answer to the question, though, is not "Can I really know if I'm looking at a zonkey or a zebra?" Rather, the real question is, "Whose job is it to be able to know how to tell the difference?" The thought experiment errs by assuming that just because person X can't tell the difference, knowledge isn't possible. It is possible, though, for the zoologist; and he's probably the one who put the sign on the cage. So, can person X know that he's looking at a not-mule? Yes, if the zoologist can be trusted. Bill Whittle wrote about that, once. That's why the climate-change apostasy is so disturbing: it's a direct assault on that web of trust upon which civilization is founded. Did you know that there was talk of a Nazi edition of The Hobbit? The article goes on to wonder why there are no Jews in the top authors of fantasy literature. Tolkien's remark about giftedness is clearly on point: the author of this piece can unselfconsciously wonder about "an entire literary genre—perhaps the only such genre—in which Jewish practitioners are strikingly rare." Who besides the Jews could honestly claim that there was only one literary genre in which they were rare? Not many! The investigation is an interesting one. To answer the question of why Jews do not write fantasy, we should begin by acknowledging that the conventional trappings of fantasy, with their feudal atmosphere and rootedness in rural Europe, are not especially welcoming to Jews, who were too often at the wrong end of the medieval sword. Ever since the Crusades, Jews have had good reasons to cast doubt upon the romance of knighthood, and this is an obstacle in a genre that takes medieval chivalry as its imaginative ideal. It is not only that Jews are ambivalent about a return to an imaginary feudal past. It is even more accurate to say that most Jews have been deeply and passionately invested in modernity, and that history, rather than otherworldliness, has been the very ground of the radical and transformative projects of the modern Jewish experience. It goes deeper than this, though, if I may say so. Jewish thinkers have very often been suspicious not merely of feudal or medieval ethics, but of heroic ethics. I suspect the reason has to do not nearly so much with our history or literature, as with their own. After the battle is won, the Israelites capture the five fleeing Ammonite kings. Joshua drags the monarchs before him and orders his generals to "put your feet on the neck of these kings." As they stand on the kings' throats, Joshua tells his commanders, "Do not be afraid or dismayed: Be strong and courageous; for thus the Lord will do to all the enemies against whom you fight." Then, Joshua himself executes the kings and hangs their bodies in the trees. This episode is so proudly barbaric that it's painful to read. It's clear that we readers are supposed to take the Israelites' side here—they're conquering the Promised Land, they're God's Chosen People, the Ammonites are vile statue-worshippers, etc.—but the unapologetic savagery is hard to bear. This probably reveals a profound weakness in me, but I imagined myself—in the way one always imagines oneself inside a book—not as one of my own ancestors, the victorious Israelite generals, but as a heathen king with a boot on my neck, moments from a brutal death. Joshua and the Israelites have been doing nothing but killing in this book—killing by the thousands, killing women, killing children, killing animals—but it is the death of these five men, who aren't even innocents, that inspires the most revulsion. There's an obvious reason for this, one Stalin understood: "A single death is a tragedy, a million deaths is a statistic." All the other killings in Joshua are mass killings. This is the only time the book of Joshua gives us death in a tight close-up, and it's appalling. To Eglon … [They] struck it with the edge of the sword, and every person in it he utterly destroyed that day … etc. etc. The worst parts of Leviticus seem positively joyful compared with this smug roster of slaughter. Read that in the echo of the Holocaust, and you can begin to understand why there is little interest in writing Jewish heroic fiction. The tradition they would naturally draw on leads directly to a soul-shaking conflict, for their own heroes treated the women and children of fallen nations in a way that has to be horrifyingly familiar. Consider Simone Weil's War and the Iliad as a counterexample. Weil was Jewish by ancestry, though she became a Christian mystic after a religious experience at Assisi. Her work is characterized as "an inspired analysis of Homer's epic that presents a nightmare vision of combat as a machine in which all humanity is lost." She actually calls it "the only true epic the Occident possesses," standing head and shoulders over all the other great poems and tales of the West because it treated the slain with the same sympathy as the slayers. It may be the only poem that ever has, not merely in the West. Yet it is no accident that Tolkien's Catholicism could stand as a root for a recovery of the heroic tradition, even in the wake of World War II. It was the Catholic tradition that gave rise to the concept that the hero defends the innocent as well as fighting his enemies; and that their women and children are not legitimate targets. The Peace and Truce of God was a medieval European movement of the Catholic Church that applied spiritual sanctions in order to limit the violence of private war in feudal society. It is not, then, simply that the Jews of the Middle Ages suffered from the swords of knights -- though they certainly did, at times. It is that modern heroic literature is rooted in a concept of what it means to be a hero that is originally Catholic; it is not rooted in Jewish epics, in the ancient Greek epics, any more than it is rooted in Chinese or "Aryan" epics. If Tolkien and C. S. Lewis were the first to pull it forward, it is because they were closest to the garden in which it grew. Let that not be the last word! The modern world needs heroes, and it needs heroes from precisely this tradition. If Jewish writers want to tackle heroic writing, this is the road to take: one that views their enemies as potential friends, and their enemies' innocents as sacred. Anyone who can write in that tradition will be improving our world: we need far more of that vision than we've had. Unfortunately, the essay ends pointed in another direction. The final example, of what the author hopes is an emerging tradition of Jewish heroic fiction, is merely self-obsessed. [T]heir deepest struggles are expressed in the language of contemporary self-actualization. “Before I can return with you to any human realm and be who you expect me to be,” Yonatan tells the empress with whom he has fallen in love, “I have to deal with who I am.” The empress meanwhile learns that, to fulfill her own magical quest, she must discover that “the abyss is within you … you must jump into the depths within yourself.” Yanai’s former involvement in Israel’s New Age culture—she wrote for a prominent New Age magazine, spent time in a Buddhist monastery in Japan, and edited a volume of literary erotica by women before turning to fantasy—makes itself felt here. The author says that he would hesistate to give the book to a teenager, because it contains nothing they don't already know. Self-esteem is not the reward the hero seeks. Honor is sacrifice. It is repaid not with self-love but with the love of those you have served. For Tolkien's tradition, it was both God and one's beloved that one served, in the hope of love. As Wolfram von Eschenbach's Willhelm said to his knights, "There are two rewards that await us: heaven, and the recognition of noble women." For those who wish to write in another tradition, you can speak of service to the ethic of heroism instead of service to God; you can speak of service to any beloved person or community. Yet it is service that defines. She, like many Tea Party members, resists the idea of a Tea Party leader — “there are a thousand leaders,” she says. Him, too, divine providence, his right of succession according to or laws and customs which we shall maintain to the death, and the due consent and assent of us all have made our Prince and King. To him, as to the man by whom salvation has been wrought unto our people, we are bound both by law and by his merits that our freedom may be still maintained, and by him, come what may, we mean to stand. Yet if he should give up what he has begun, and agree to make us or our kingdom subject to the King of England or the English, we should exert ourselves at once to drive him out as our enemy and a subverter of his own rights and ours, and make some other man who was well able to defend us our King; for, as long as but a hundred of us remain alive, never will we on any conditions be brought under English rule. It is in truth not for glory, nor riches, nor honours that we are fighting, but for freedom — for that alone, which no honest man gives up but with life itself. It must not be enough that a person says the right things; we need them to do the right things. These things will be hard, but it is time to start taking apart the anti-constitutional parts of the Federal government, and restoring the Constitutional order. The Federal government certainly has a role, but it is a role limited by enumerated powers, balanced and checked.